After having a hectic festival season, slowly I have started realizing that the year 2015 is coming to an end. It gave me lot of pleasure when I was looking back and rewinding happy moments of the year, mostly it was the year of having party on every weekend with our close friends J. Before the new year begins, we are planning to visit our home country. So I am very excited about the trip and nervous at the same time, because not ready yet with packing and shopping. But whenever I think that soon will meet my parents and relatives after a year, it makes my mind delighted. 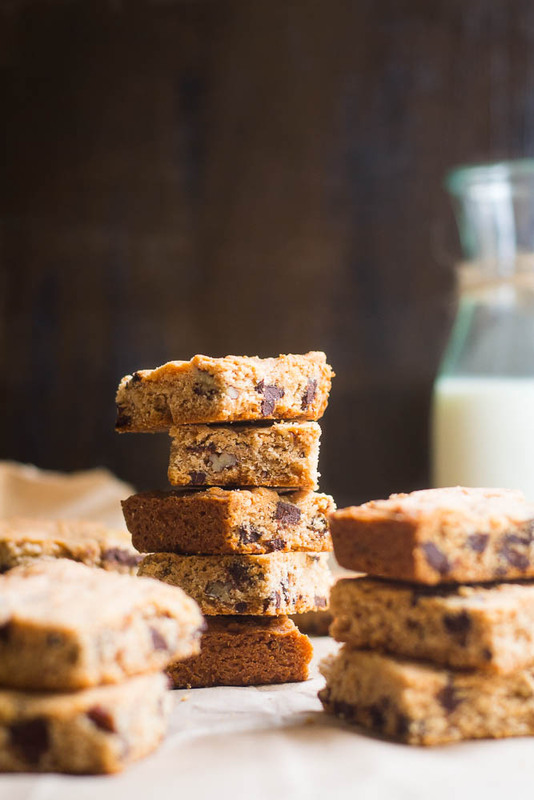 Today I will share a recipe of rich sweet dessert bar, Chocolate Chip Pecan Blondies. You can save this recipe for holiday baking. 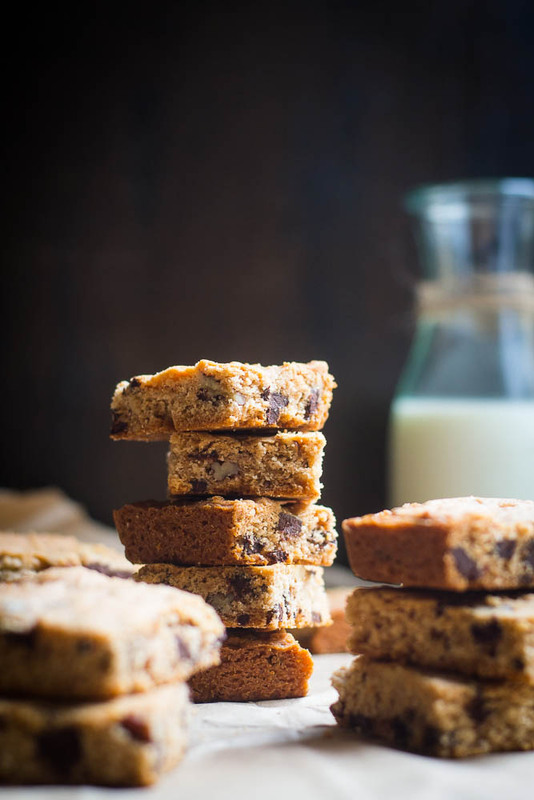 Blondies are like partly cookies, partly brownie made of flour, brown sugar , butter , eggs and baking powder. They are baked in a brownie pan and then they are cut into squares to serve. 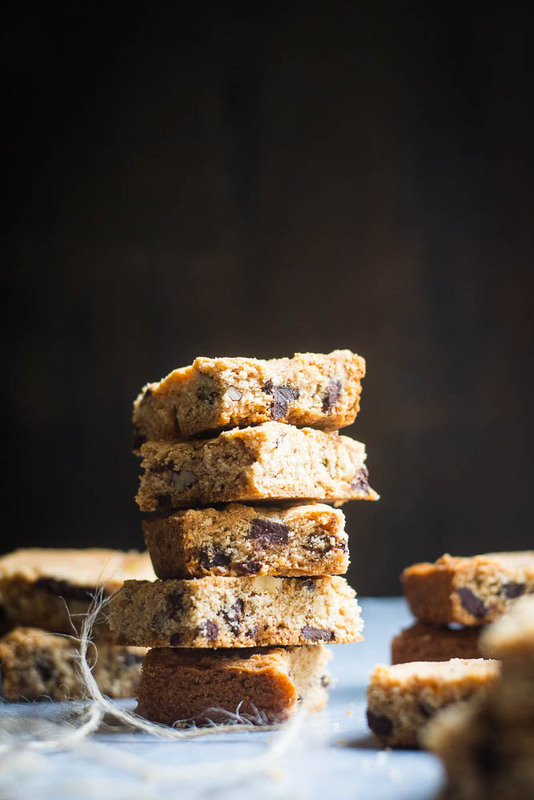 Though they are like cookies and brownies , but much more easier to make than those two. You don't have to roll the dough into balls like in cookies or there is no chocolate to melt like in Brownies. The version, made with Chocolate chips and pecan is my favorite, but you can omit the pecan from recipe if you have a nut allergy. Though the traditional recipe is with egg, but unfortunately I didn't have enough eggs when I tried the recipe. I used plain yogurt in the place of eggs and came out darn good. 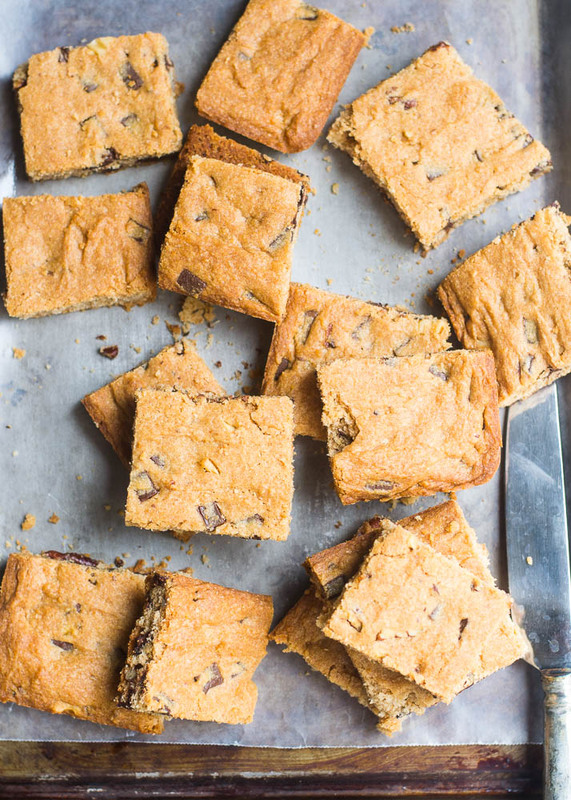 So out of necessity an egg-less Blondies was born. I know many of you who don't like to eat eggs can try this recipe. It has become a huge hit for my family and friends who have tasted it that day. So I will prepare again this recipe once I am back from my holiday season. 1. Preheat the oven to 350 degrees F. Lightly grease a 13-in. x 9-in pan then line the pan with parchment paper, again spray it with non-stick cooking spray. 2. In a large bowl, combine butter, brown sugar, sugar, yogurt and vanilla extract, just until blended. 3 In a separate bowl, combine flour, salt and baking powder, mix well. Now add the flour mixture to the sugar mixture. Gently mix it together. Stir in chocolate chips and pecan. Transfer the batter to the prepared pan. 4. Bake it for 25 to 30 minutes, until the top becomes lightly brown and a toothpick inserted into the center comes out clean. Cool on a wire rack completely. Cut into bars.